I love tofu. I don’t know where or when this love began, but China sure does provide me with lots of reasons to continue to eat this protein-rich superfood. Why does tofu get such a bad rap in the US? Probably because a)people don’t know how to cook it properly and b)there aren’t as many varieties. While living in China, I’ve indulged in everything from the fluffy soft douhua (豆花) on top of my mixian (米线), a Kunming favorite or in a bowl, still warm with a little bit of sugar stirred in. Drinking fresh, warm soy milk from the morning market is nothing like the refrigerated Silk that tastes like a chocolate milkshake (even though, I must admit, I like that too). The soy milk here is thin, watery, and earthy. Sometimes they grind up several different kinds of beans with the soy milk so that it is actually a bean smoothie. Talk about protein! They deep fry tofu, serve it on sizzling iron plates (铁板豆腐), grill it, mix it with meat and spices, stir fry with veggies… I could continue. One of my favorite kinds of tofu here is called “dried tofu” or 豆腐干. It’s sold at my market in little squares like this. I think maybe it is steamed or smoked, which gives it a meaty flavor. It is also very firm so it’s perfect for stir fry. Another favorite variety of tofu is strangely (?) called tofu skin (豆腐皮）and is long, thin strips about the width of noodles all the way up to wider ribbons . It’s great served in cold salads like the one pictured above, but also nice in hot pot or soups. 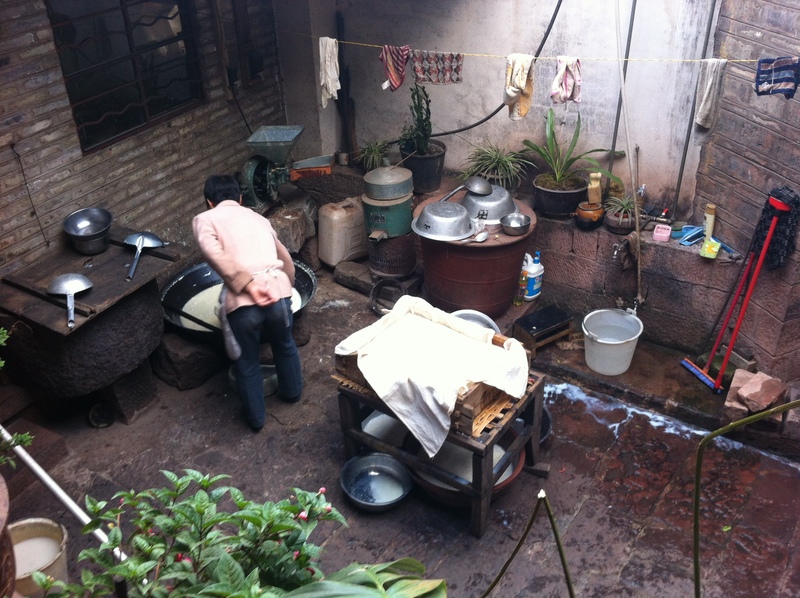 When I was in Nuodeng on my weekend away, I saw my guesthouse owners making their own tofu the old fashioned way. We ate the freshly made bean curd the next day and it melted in my mouth. Perfection! Enjoying my fresh tofu, straight from the wok! In the background you can see that she’s almost filled the box. When it’s filled, she puts a wooden board on top, and two large bricks. Overnight they will force out lots of the water, so in the morning she’ll have a huge block of tofu to chop up and sell at the market. Want to know more about the tofu making process? 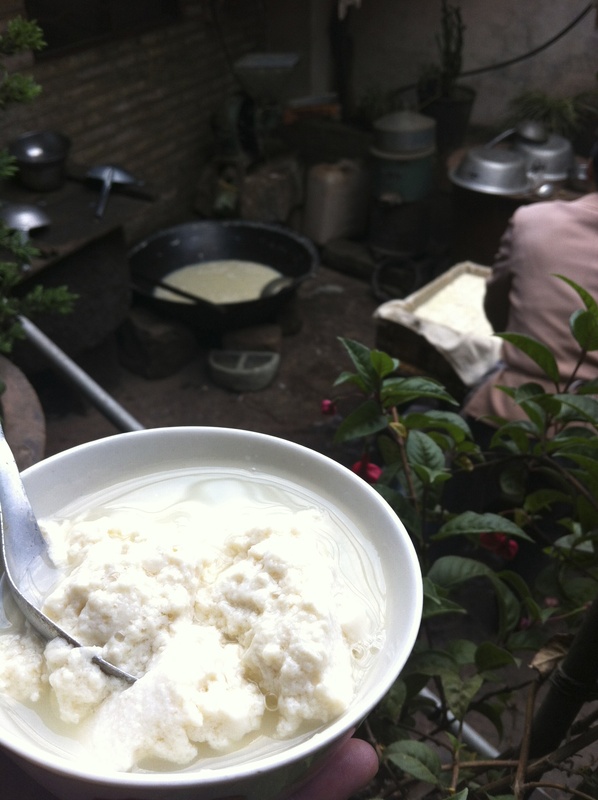 Watch this video about a great restaurant in Kunming and their homemade tofu. Maybe I can give it a try in the US?!? 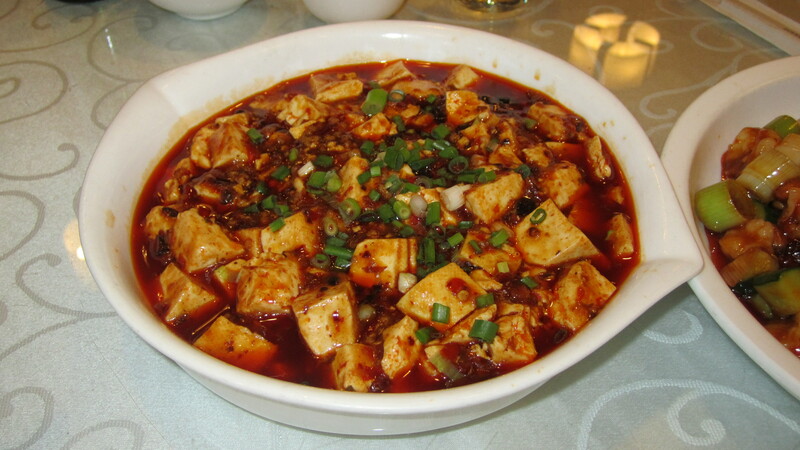 When you are back in the states you’ll have to educate me about tofu and lots of other Chinese favorites. Looking forward to the day! I love tofu. Definitely miss the tofu in China!